Most of us spend our early to mid-20s enrolled in college or internship programs, building up our résumés and trying to land entry-level positions that we can move up from. It’s the time when we build our professional foundations and simply try to get in the door. Most of us are not already thinking about running the show; even those who are typically expect to wait years before taking that risk. Not Athena Kouimanis. In late 2014, when she learned of an opportunity to take over a longstanding community restaurant, Curly’s Grille in Lackawanna, she jumped at the opportunity, and became a restaurateur at only 24 years old. And thus far she’s been successful. 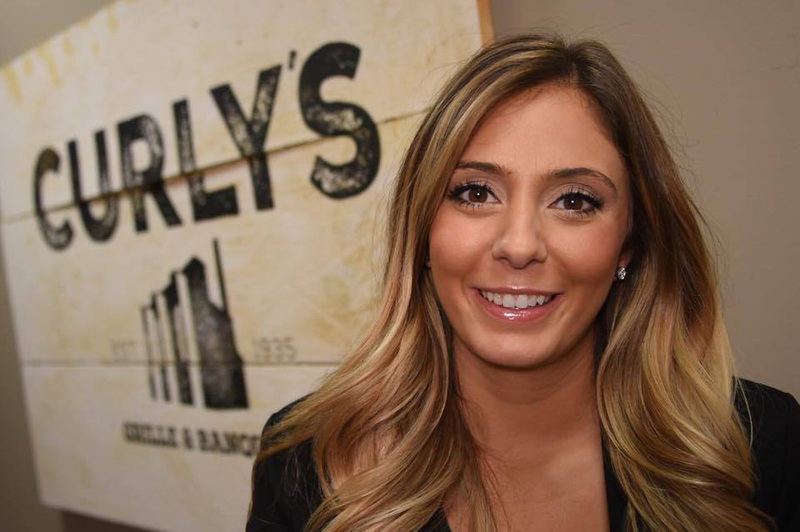 She’s made some changes both to the decor and menu at Curly’s, business there is booming, and earlier this year she was included in the Buffalo Business First 30 under Thirty list of successful young professionals. Perhaps Kouimanis has been able to make it work because she had the right kind of experience going in. I guess you could say it was quality over quantity. From 2010 to 2012, Kouimanis worked as a server at Black and Blue in Williamsville, gaining front-of-the-house experience. She then majored in restaurant, hotel, and tourism management at Ohio University, despite the fact she was initially reluctant to go into the hospitality industry. “I always said I wasn’t going to go into [hospitality] and somehow I got sucked into it. I was doing pharmacy, but I really like working with people. I’m a people person,” she said. While studying at Ohio, she landed an internship with Acqua Restaurant & Catering (the company that owns and operates the Foundry, the Hatch, and banquet rooms at the Hotel Lafayette). Upon graduating, she received a position at Acqua, where she worked in sales and event planning. She says it was her experience at Acqua that helped her transform Curly’s into the modern, fine-casual dining establishment it is today. Opened in the 1930s under Curly Worthing, the restaurant was for decades a typical bar and grill in a blue-collar steel town. When the time came, Curly passed on the restaurant to his son, Paul, who passed it on to his daughter, Krista. At the time Krista took over, the restaurant had seen better days (as had Lackawanna, and of course Buffalo), so she decided to shake things up. She had been living in the Caribbean with her husband, Kirk (whom she met at the American Culinary Institute, from which both graduated), before returning home, so Island cuisine seemed like a natural choice. After all, where else could you find Jamaican jerk chicken and Cuban sandwiches in the Buffalo of yesteryear? Before Kouimanis, Curly’s was not exactly subtle about its tropical flair. She says the walls were bright red and adorned with pictures of tropical islands. In her renovations, she was inspired by the history of Curly’s and the city it sits in—a now-rusted blue collar steel city that literally got its name from the Lackawanna Steel Company—by bringing in more wood and darker tones. “I’ve tried to keep all generations of Curly’s—the grill, the Caribbean, and now modernizing it,” Kouimanis said. Though she was well-positioned to take on such a demanding job, there was one area in which she totally lacked experience—Jamaican jerk seasoning. She added that she has also never been to the Caribbean, but assured that she does try every local jerk blend she can get her hands on and has reached the admittedly biased opinion that Curly’s has the best in the area. She also assured would-be diners that their version of the spice blend—which typically includes allspice, garlic, thyme, and hot peppers—goes easy on the heat. Newcomers to jerk should also consider that it offers a much broader range of flavors than, say, our beloved Frank’s and butter. Curly’s is so well-known for its jerk that Kouimanis recently introduced “Jerk Thursdays,” when they offer discounts on jerk wings and jerk fries, as well as their black bean soup and other rotating specials. But she also doesn’t want Curly’s to be pigeonholed as a Jamaican restaurant, and the expansive menu offers unique takes on local pub-food favorites (a beef on weck mac and cheese, a fried polenta poutine) and on dishes from the opposite ends of the Earth—Thai noodles and an Asian chicken salad. Since taking ownership, Kouimanis has tweaked the menu and says she’ll make more changes going forward, including seasonal offerings. But she is careful not to change things too drastically, as she sees Curly’s as deeply rooted in Lackawanna and vice versa.Many of their customers have been regulars for years, and some employees have been with the restaurant for decades—a rarity in the typically high-turnover food industry. One bartender of eight years, Cindy, said Curly’s has a loyal customer base, dedicated staff and praised the changes made under Kouimanis. In some ways, doing so would be vindication against those who doubted her in the early days, simply for being a young woman in a challenging industry. But between her success at Curly’s and the Buffalo Business First 30 Under Thirty honor, it’s probably safe to say she’s already shown the naysayers what she’s capable of. Curly’s is located at 647 Ridge Road in Lackawanna. The restaurant is open from 9am to 9pm Monday through Thursday, 11am to 10pm Friday, 4pm to 10pm Saturday, and 4pm to 8pm Sunday. For more information, visit www.curlysgrille.com or search for the restaurant on Facebook.